Bunnies feed on flowers, stems, bulbs and fruits produced by garden flowers, so they can quickly chew your garden to the ground when feeding in the evening or morning. Plants in the rose family (Rosa spp. ), hardy in U.S. Department of Agriculture plant hardiness zones 3 through 9, and the lily family (Lilium spp. 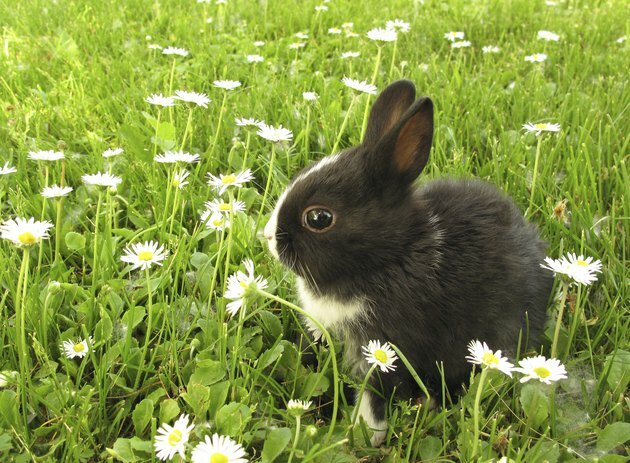 ), hardy in zones 3 through 9, are favorite treats, but few flowers are safe from a hungry bunny. Rabbits feed on garden plants year-round. A 2-foot-tall fence keeps small bunnies, like cottontails, out of the garden, but larger rabbits, like jack rabbits, require a 3-foot-tall fence. Make the fence out of 1/4-inch wire hardware cloth or plastic bird netting attached to stakes around the outer perimeter of the garden. A bunny can push its way beneath a fence, so prevent this by burying the bottom of the fencing material 4 inches into the soil. If your yard is already fenced, burying hardware cloth 4 inches deep around the perimeter and plugging up any gaps in the existing fencing will keep the bunnies from digging beneath it and into your garden. Brush piles and garden debris provide cottontails with protection, which makes your garden a more inviting place to feed. Keep grass and brush mowed, and remove any piles of brush or wood. Low shrubs may also provide cover, so pruning these off the ground can help lower bunny populations. Unlike cottontails, jackrabbits prefer open areas, so long grass and brush piles will make your garden less inviting than a perfectly manicured yard. Scare devices include wind-operated pinwheels, silver bird tape and motion-activated electronic devices or sprinklers. Although these may frighten off the rabbits for a short time, they eventually become used to them. The scare device also only works in the area immediately surrounding it, so a large garden bed requires multiple devices. Although scare devices may frighten off one or two rabbits, they aren't a long-term solution for an ongoing bunny problem. Odor repellents containing ammonium or potassium salts, or naphthalene, may deter bunnies for a short period, but they wash off if it rains or during watering, and they aren't safe for edible plants. Although mothballs contain naphthalene, they are lethal and should not be used around animals. So only use naphthalene repellents labeled for garden use. Spray these ready-to-use products directly on the ground around the perimeter of the flower bed. Hot pepper sprays sprays containing capsicum repel by taste. These are usually applied in an even coat directly to the plants the bunny is feasting upon. Reapply repellents after it rains or after watering so they don't lose effectiveness.